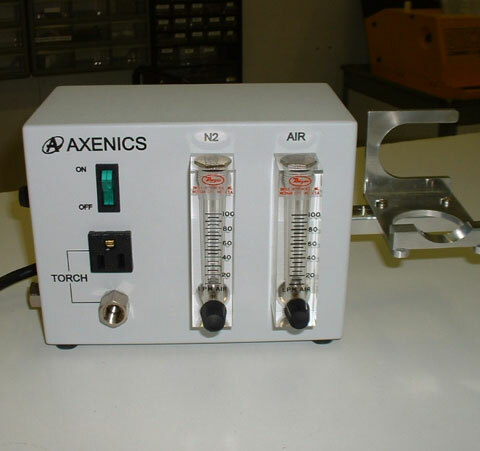 The AXENICS Model N2S100 Nitrogen Saver offers accurate, dependable flow of nitrogen for hot gas welding of plastic materials. The N2S100 automatically switches from nitrogen (while welding) to compressed air (while at rest), which greatly reduces overall nitrogen consumption. Unlike other nitrogen savers, the N2S100 has no pressure regulator. Instead, it has independent, adjustable flow meters, which allow for the precise control of gas flow through the welding torch. This unique design allows for a large variation of pressure between inlet gasses (30 PSI to 100 PSI). The N2S100 is constructed of heavy gauge steel and can be wall mounted or set on a bench top for ease of use. The universal torch rest will accommodate most brands of torches and custom brackets are available for specific applications. The unit operates on 120V AC, includes an 8-foot cord, an illuminated power switch, and a 15amp receptacle for the torch. Air flow continues through the torch when power is turned off, which allows the torch to cool down and prevent damage to the heating element. Gas connections are brass ¼” NPT. The overall dimensions are 8″ x 6″ x 4/12” deep. The N2S100 Nitrogen Saver can be used in any industry that performs plastic welding services. One such example is the soldering industry, which has used the N2S100 for the soldering of aviation parts that have to be worked in a nitrogen atmosphere (such as on circuit boards for solar panels that are going out into space) to avoid contamination. This unit saves more than 50% of nitrogen used in this particular application. The AXENICS N2S100 Nitrogen Saver is designed to provide a trouble-free solution to plastic welding operations. Add an Axenics N2 Saver to your shop or production facility. Contact us today.